This VO-1000 was built in August 1945 under serial # 72044 for the Milwaukee Road (Chicago Milwaukee, St Paul & Pacific) Road # 1688. 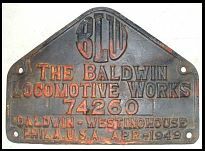 This is an early style Baldwin five point builders plate made of cast steel. Chesapeake & Western, Class DS-4-4-660/1 (NA, Phase 1b which denoted a flat front grill on models built between 10/1946 to 12/1947).Road # 662. 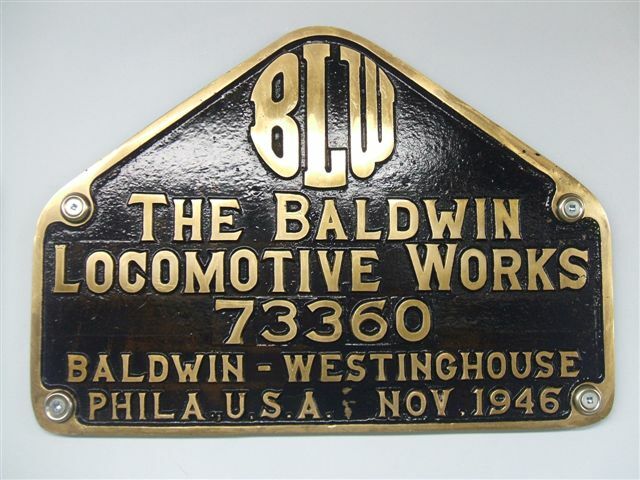 Baldwin Serial # 73359, completed on the 12th December 1950. Engine type 606NA. 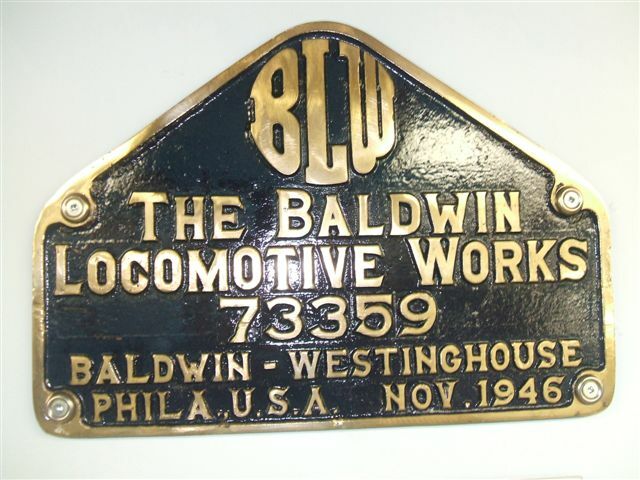 This was one of only three Baldwin's owned by the C&W. The locomotive builders plate is a brass five point builders plate and in ex-locomotive condition (the road grime was removed off the builders plate with a mild detergent and lots of scrubbing, then clear lacquered was applied over the original paint for a shiny finish). Chesapeake & Western, Class DS-4-4-660/1 (NA, Phase 1b which denoted a flat front grill on models built between 10/1946 to 12/1947).Road # 663. Baldwin Serial # 73360, completed on the 14th December 1950. Engine type 606NA. The locomotive builders plate is a brass five point builders plate and in ex-locomotive condition (the road grime was removed off the builders plate with a mild detergent and lots of scrubbing, then clear lacquered was applied over the original paint for a shiny finish). Pennsylvania Railroad, DS-4-4-1000/1 (SC), PRR class BS-10a, Road # 5968. Baldwin Serial # 73586, delivered in March 1948. Engine type 606SC. 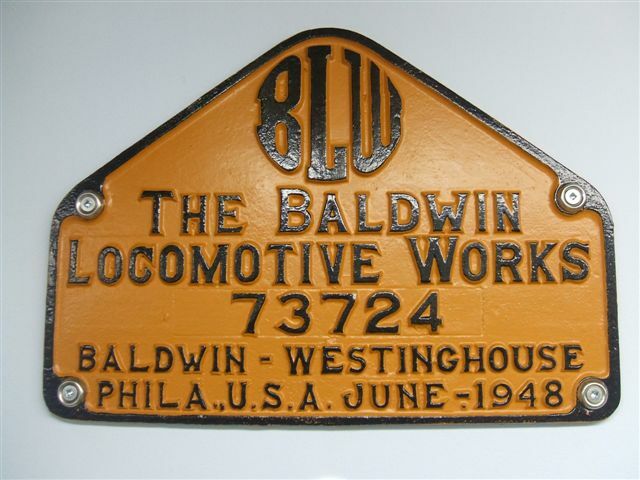 This locomotive was part of a massive fleet of Baldwin switchers owned by the PRR. The locomotive made it to Penn Central and carried road # 7939. 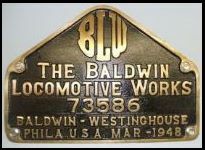 This builders plate is made of brass and is one of the later Baldwin five point designs. Elgin, Joliet & Eastern commonly known as the "J"ordered 26 qty, DT-6-6-2000/2 (SC) for transfer service. Baldwin Serial # was 73724 and the road # was 116. This locomotive was delivered to the J on the 24th June 1948. Engine type 606SC. These massive six-motor, twin -engined 2000-hp monster centercab locomotives were the J's primary road locomotives. Almost half of these locomotives were repowered by EMD. 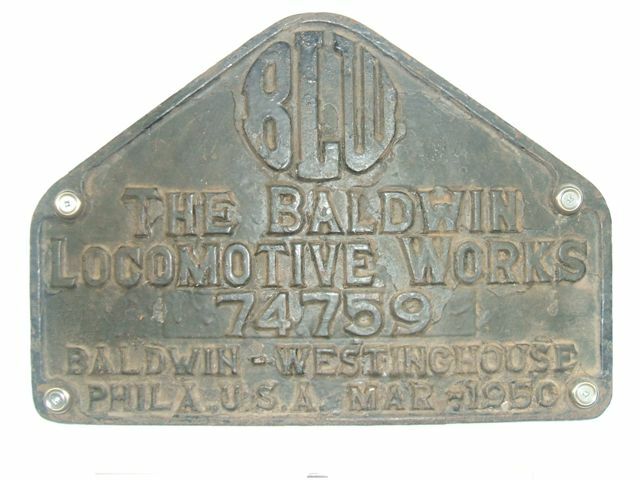 The locomotive builders plate is a cast steel five point builders plate. Pennsylvania Railroad, Class DR-4-4-1500/1 (SC), RF16B, Cabless B unit. 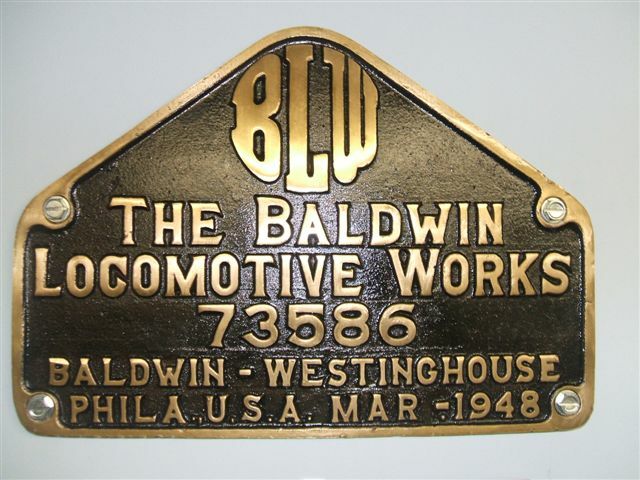 Baldwin Serial # 73987, completed on the 31st March 1949. Engine type 608SC This is one of 30 qty units built for the PRR and carried road # 9575B. 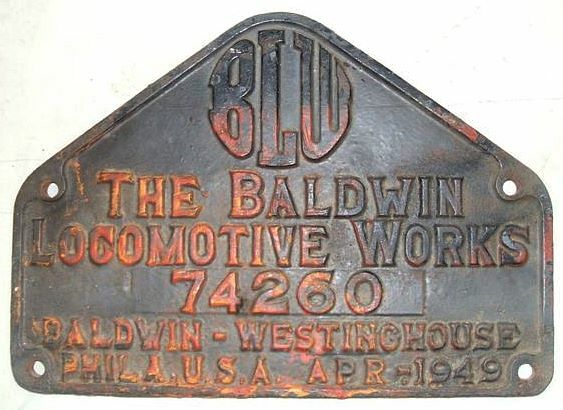 This is a Baldwin five point builders plate made of cast iron and in ex-locomotive condition (just look at the road grime, boy the PRR sure were rough on their equipment !!!). Southern Pacific class DERS-2. Baldwin serial # DS-6-6-1500/1 (SC), Road #5206. 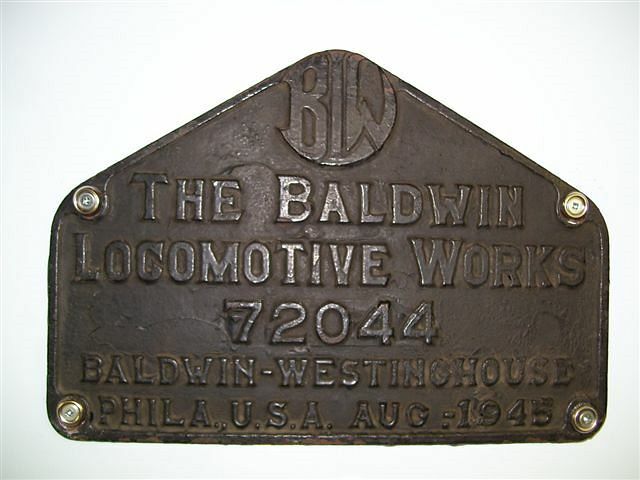 Baldwin Serial # 74260, delivered on 10th May 1949. Engine type 608SC producing 1500 HP. This group of ten, DS-6-6-1500's, Road # 5203 to 5212 were built with General Steel castings cast underframes; uneven axel spacing accommodates three traction motors per truck and the radiator air intakes are low (until the later modification by Southern Pacific to higher radiators a couple of years later making them class # DF-101). Another great spotting feature for this class was the extended exhaust stacks. In August 1965, 5206 was traded into EMD. This five point builders plate is made of cast iron and in ex-locomotive condition. You can see clearly on the plate that the locomotive carried the attractive Southern Pacific, Tiger stripe paint scheme. Pennsylvania Railroad, DS-4-4-1000/1 (Phase IIc), PRR class BS-10a, Road # 5550. Baldwin Serial # 74759, completed on the 2nd March 1950. Engine type 606SC. This locomotive was the first 1000 HP Baldwin switcher to be built on a fabricated steel under frame (excluding Oliver mining Locomotives 907 - 909 which were special order). The life of this locomotive extended into the Penn Central years carrying road # 7950. The PRR owned 127 qty examples of the DS-4-4-1000 making it the largest class of Baldwin switchers the PRR owned. 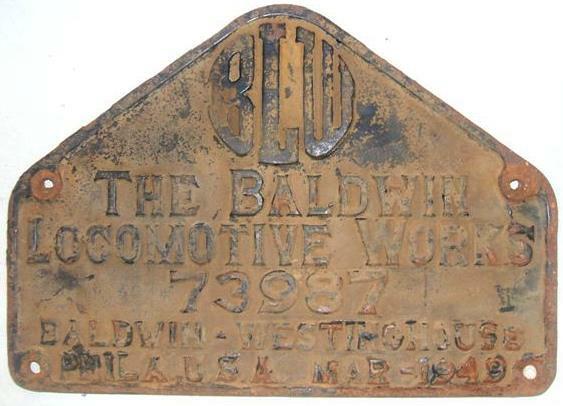 This builders plate is a cast iron Baldwin five point builders plate and is in as removed condition.